The first images released in 2016 of Pluto by NASA’s New Horizons mission team show the direction of flowing ice on the dwarf planet’s surface, along with terrain patterns that suggest thermal convection is taking place on the icy surface of the area known as Sputnik Planum. Mission scientists combined images taken by New Horizons’ Long Range Reconnaissance Imager (LORRI) with color photos taken by the spacecraft’s Ralph Multispectral Visible Imaging Camera (MVIC) to create a composite image (above) of a region to the left of Sputnik Planum known as Viking Terra. The LORRI device acquired the images from a distance of 31,000 miles (49,000 km) of features as small as 1,600 feet (480 meters) across; the MVIC instrument obtained the images from a distance of 21,000 miles (34,000 km) at a resolution of 2,100 feet (650 meters) per pixel. Both the LORRI and MVIC images were taken on encounter day, July 14, 2015, with the MVIC photos captured about 20 minutes after those snapped by LORRI. By overlaying MVIC’s color data on top of LORRI’s mosaic, scientists can see significant detail across the 160-mile (250-km) region, including crater rims covered with bright methane ices, layering along both crater walls and steep cliffs, and dark red tholins in low-lying areas. The bright ices likely condensed on the crater rims. Tholins are small, dark particles produced by atmospheric reactions of nitrogen and methane. In Viking Terra, they are seen at the bottoms of craters. Ices seem to have flowed toward channels and craters in areas that have the thickest level of red material along with smooth surfaces. Subsurface flowing ice or surface winds could be moving the tholins, which usually do not move at the level of thickness seen on Viking Terra. Evidence of flowing ice is also visible on a high-resolution LORRI image (right) showing the center of Sputnik Planum, the left side of the heart-shaped area known as Tombaugh Regio. Within the icy plain separated into polygonal cells between 10 and 25 miles (16 and 40 km) wide, a small dark patch and thousands of tiny pits are visible. 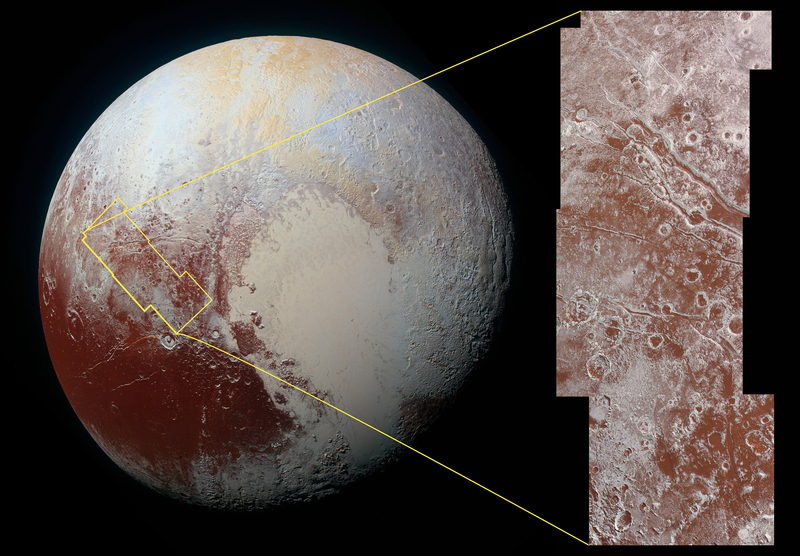 To mission scientists, the cell patterns indicate the ices on Pluto’s surface are undergoing slow thermal convection. Though at a lower elevation than surrounding terrain, the polygonal cells confirm Sputnik Planum is not entirely flat. Images taken from low-Sun angles, in which shadows are clearly visible, show the cells to have ridged margins and slightly elevated central areas. The height of these central areas varies within a range of about 100 yards (or 100 meters). William McKinnon of Washington University in St. Louis and deputy lead of New Horizons’ Geology, Geophysics, and Imaging (GGI) team, compared the slow thermal convection process taking place within Sputnik Planum with the movement inside a lava lamp. “This part of Pluto is acting like a lava lamp, if you can imagine a lava lamp as wide as, and even deeper than, the Hudson Bay,” he said. Beneath the mostly nitrogen ices on Sputnik Planum likely sits a reservoir of solid nitrogen several miles deep. Pluto appears to have an internal heat source which warms up that nitrogen, making it buoyant and causing it to rise to the surface. Once there, the ice eventually cools and sinks back down. The ridges separating the polygonal cells were likely produced when cooling ice sank back into the subsurface reservoir. Computer models confirm this cyclic process can occur over millions of years. The ridged margins, which mark where cooled nitrogen ice descends in the convection process, become pinched off and abandoned. The “X” feature in the image is probably one of these – a former quadruple junction where four convection cells met. Several, active triple junctions can be seen elsewhere in the LORRI mosaic. In a blog post dated January 8, 2016, GGI team scientist Orkan Umurhan discusses his team’s use of computer modeling to understand better the glacial flow from highlands on the east of Sputnik Planum onto the plain itself. Interested readers can learn more here. The strange dark area at the center of Sputnik Planum is believed to be a block of water ice that has risen from the interior and is now floating in solid nitrogen. It was likely produced when four separate convection cells came together. Similar features seen in the LORRI mosaic appear to have been produced by the conjunction of three separate convection cells. Mission scientists speculate the myriad tiny pits in the area formed via sublimation, a chemical process in which a solid turns into a gas without going through the intermediate liquid phase. Two of Pluto’s highest mountains – Wright Mons and Picard Mons, which are 13,000 and 18,000 feet (4 km and 5.5 km) high, respectively – look exactly like volcanoes on Earth when viewed from orbit and are, therefore, suspected to be cryovolcanoes. Both mountains have holes at their summits that are likely caused by an eruption of a mixture of water ice and frozen nitrogen, ammonia/methane from underneath. Cryovolcanism could play a key role in helping scientists understand Pluto’s geologic and atmospheric history. For some scientists, the faults and fissures on Pluto’s surface, along with the planet’s lack of an equatorial bulge, suggest the presence of a subsurface ocean. Equatorial bulges are created by the spin of rotating spherical objects. Because water moves more easily than ice, an underground ocean would reduce any bulge by acting against rotational forces, New Horizons scientist Francis Nimmo of the University of California at Santa Cruz, said. An ocean on Pluto would likely be made up of a combination of water ice, methane ices, and carbon dioxide. “It’s hard to imagine how rapidly our view of Pluto and its moons are evolving as new data stream in each week,” noted mission Principal Investigator Alan Stern. This week, the National Space Club announced the New Horizons mission team as the winner of its 2016 Dr. Robert H. Goddard Memorial Trophy, the highest honor the club awards for groundbreaking leadership within the U.S. in space and aeronautics. Stern will accept the award on behalf of the team at the 59th annual Robert H. Goddard Memorial Dinner at the Washington Hilton on Friday, March 11. Anyone interested in attending should visit http://www.spaceclub.org , email info@spaceclub.org , or call 202-547-0060. This is a phenomenal example of reality-based science, where we try to make sense of what is actually observed. So much of what shows up on ‘science’ based sites is theory (mostly mathematical hallucinations) that has almost no basis in reality. I’m shocked to be resigned to conclude that Pluto doesn’t harbor a black hole, not even a nano-scale one, or some weird sort of feebly pulsating neutron star cinder. How disappointing! The New Horizons team cannot be applauded enough in the thrilling performance of its mission. My question has to do with the fact that most of the “water” found on Pluto, it has been taught to us for years, exists in solid form, very little in the form of ice but mostly in the form of gas hydrates. These gas hydrates, specifically, are mostly methane hydrates, nitrogen hydrates, and various mixed hydrates of methane, nitrogen, and other gases. It is known that some of the physical properties of gas hydrates are similar to those of ice, but, for example, the thermal conductivity of gas hydrates is significantly lower than that of ice. The density of gas hydrates and the density of ice are similar but not exactly the same; and therefore, although the thermal conductivities for many solids is directly correlated with their densities, the thermal conductivity of gas hydrates is anomalous. So do large accumulations of gas hydrate cold-flow similarly to the way that ice cold-flows in glaciers? Or not ? And if not, is it to be concluded that the “ice flow visible … in new high-resolution images” is evidence that Pluto is mostly water-ice and not gas hydrates?